The deep-dive survey into views of technology draws a picture of Americans struggling personally with their social-media habits and looking for more supervision of social-media companies by the federal government. Pollsters said they were surprised by the high and relatively uniform dissatisfaction with social media across demographic and political groups. While they take a skeptical view of social-media companies like Facebook and Twitter, Americans have favorable views of Amazon, Alphabet Inc.’s . . . Google unit and Apple, though they have little faith in the ability of these three tech giants to protect their personal data. [A]lmost three quarters of respondents said they believe the trade-off that underpins the huge sector—consumers receiving free services but giving up detailed data about their online behavior—is unacceptable. And a solid majority of respondents said social-media services such as Facebook and Twitter do more to divide Americans than bring them together. PG wonders if there is any manner in which Facebook can’t screw up. The internet, the web, all things digital are officially in beta. Because they’re in beta, everything is forgiven—there is absolution for the infelicities, the flaws and the wrongs, intended and unintended. Here we are in the midst of e-evolution, looking for a moral and intellectual GPS at a time when our phone is supposed to measure heartbeat, steps walked, stairs climbed and hours slept, but gives no true sense of perspective or place. Yet there is an awakening, and we are on the cusp of a reckoning. The digital world has brought manifold benefits, but it shouldn’t surprise us that there are problems with provenance and opportunities for bad actors to damage democracies. A few facts about the media: Some 1,800 U.S. newspapers have closed in the past 15 years. An industry that employed 412,000 people in 2001 declined to 166,000 in 2017. Have the digital natives succeeded where the traditional titles have failed? No. In recent weeks, BuzzFeed, Vice, the Verizon digital properties and others laid off more than 2,100. The creators are still being slain by the distributors, who are publishers, though they find it hard to pronounce the word. If you are intervening to filter out offensive material, you’re editing, and if you are editing, you should aspire to be a great editor, not selective and reactive but proactive. There is generally an understanding in business that connections lead to partnerships, which lead to relationships with responsibilities. But digital partnerships quickly descended into abusive relationships—serial cheating, digital denials, haughtiness, smugness, playing content creators for suckers. Allowing rampant piracy, sometimes actually encouraging it, was at the core of the business model for some. I’ll highlight one more egregious example—the Amazon Book Summary. These are blatant rip-offs, unauthorized bastardizations of best sellers that sometimes use the same cover art and for which authors and publishers receive no compensation. Amazon leveraged these unauthorized summaries by including them in its Kindle Unlimited and “Audible” subscription services. After complaints from publishers, the company promised to take action—but complaint compliance is not a sustainable strategy for Amazon, Facebook or Google. PG just searched Amazon Books for “Summary” and he was appalled at what he found. PG was an early adopter of Twitter and an early unadopter of Twitter. For him, the Prime/Slime ratio was all wrong and he was not as amused by 99.99% of Twitter users as they were amused by themselves. [F]or any digital company, an often-overlooked number is churn rate: the percentage rate at which users of a given service leave that service from one time period to the next. That is to say, it’s the percentage or number of consumers that a given company loses over time. [B]oth Snapchat and the ailing Twitter show churn rates of around 25%, meaning that both platforms have lost nearly a quarter of their user base between Q3 and Q4 2016. While churn is not necessarily a bad thing for all businesses, a high churn rate compared to your competitors can be a troubling sign. For social media and advertising platforms, it can suggest a lack of engagement and loyalty among the user base – and increased consumer dissatisfaction with the platform at large. A Twitter bot is a type of bot software that controls a Twitter account via the Twitter API. The bot software may autonomously perform actions such as tweeting, re-tweeting, liking, following, unfollowing, or direct messaging other accounts. The automation of Twitter accounts is governed by a set of automation rules that outline proper and improper uses of automation. Proper usage includes broadcasting helpful information, automatically generating interesting or creative content, and automatically replying to users via direct message. 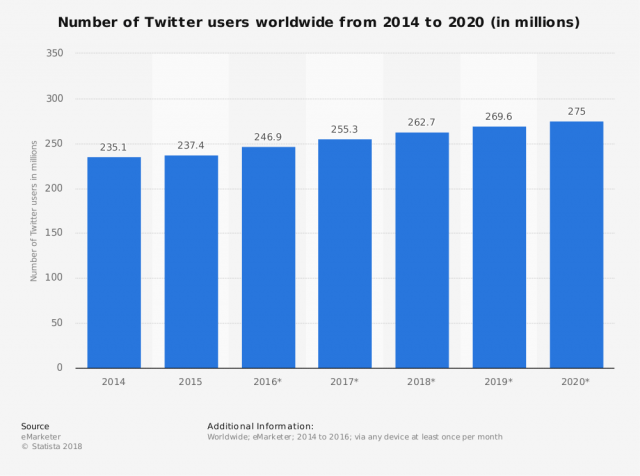 Twitter bots are estimated to create approximately 24% of tweets that are on Twitter. One significant academic study estimated that up to 15% of Twitter users were automated bot accounts. A subset of Twitter bots programmed to complete social tasks played an important role in the United States 2016 Presidential Election. Researchers estimated that pro-Trumpbots generated four tweets for every pro-Clinton automated account and out-tweeted pro-Clinton bots 7:1 on relevant hashtags during the final debate. Deceiving Twitter bots fooled candidates and campaign staffers into retweeting misappropriated quotes and accounts affiliated with incendiary ideals. The majority of Twitter accounts following public figures and brands are often fake or inactive, making the number of Twitter followers a celebrity a difficult metric for gauging popularity. If you Google free twitter followers, PG will point out another element of Twitter. You can pay to become a big shot on Twitter. On the internet, one of PG’s expectations is that whenever something is free, there is a paid version that works evey better. Looking to buy Twitter Followers? Or maybe followers onFacebook, Instagram or another social network? What’s more important, 10,000 fans or followers, or 100 who will actually engage with you? It seems this question isn’t asked too often by a number of people running social media channels who opt to buy their followers in order to boost their numbers. There are plenty of services out there which claim to boost your numbers. Many say they can boost your numbers quickly. Some services offer to do this for free and some require payment. There are a number of different methods that they can employ. Zombie Account Following. (Facebook & Twitter) By paying a 3rd party you can get 100s, 1000s of even 10,000s of followers or likes. Generally each supplier has a database of twitter or Facebook “zombie” accounts that they can use to follow or like you. These are usually completely inactive accounts, sometimes with random names with jumbled up letters and numbers. Kim Kardashian is suing U.K. fast fashion online retailer Missguided and its U.S. subsidiary for trademark infringement and violation of her right of publicity. The case is Kimsaprincess, Inc.; and Kim Kardashian West v. Missguided USA (Finance) Inc., and Missguided Limited, 2:19-cv-01258 (C.D.Cal). The complaint alleges that the inexpensive and fast fashion retailer is using Kim Kardashian’s likeness on its site and on its Instagram account to sell clothes. The pages on the site referring to the petite celebrity are no longer available, but the complaint shows a page entirely dedicated to the Kardashians, including a page named “crushin’on kim k,” featuring several photographs of Kim Kardashian, and another page named “5 party looks inspired by the kardashians” featuring Plaintiffs and several of her sisters. The complaint states that Kim Kardashian commands a fee of several hundred thousand dollars for a social media post, while “longer-term endorsement arrangements regularly garner fees in the millions of dollars.” 120 million people follow her on Instagram, and a little less than 60 million do so on Twitter. The celebrity owns also several trademarks protecting cosmetic and fragrance products. The California statutory law protects use of a person’s name, voice, signature, photograph and likeness for purposes of advertising or selling, or soliciting purchases of products, merchandise, goods or services, without this person’s prior consent. PG notes that Ms. Kardashian filed suit in California against a UK company. How does a California court have power over a company that is headquartered overseas? In civil litigation, a court in one state can assert personal jurisdiction over a defendant who resides in another state if the out-of-state defendant has sufficient minimum contacts with the state in which the court is located (the forum state). A court in California can assert personal jurisdiction over a defendant who lives in New York, so long as the defendant’s contacts with California make it fair for the California court to force him to appear in court. [I]f a Florida orange grower were to breach a promise to deliver a bushel of oranges to a buyer in Alabama, the breach of that agreement would be sufficient for Alabama courts to assert specific jurisdiction, even if the Florida grower had no other contacts with Alabama, and had never even set foot there. The lone contact of a promise to deliver something to a state is enough to give the state jurisdiction over disputes arising from the breach of that promise. Merely placing products in the “stream of commerce” is insufficient to provide minimum contacts with the states where the products end up. The defendant must make an effort to market in the forum state or otherwise purposefully avail himself of the resources of that state. However, since only four of the nine Supreme Court Justices joined the opinion that required a defendant to do more than place his products in a “stream of commerce,” some lower courts still rule that doing so is adequate for a court to exercise personal jurisdiction. commercial websites which clearly do a substantial volume of business over the Internet, and through which customers in any location can immediately engage in business with the website owner, definitely provide a basis for jurisdiction. Suffice to say, jurisdiction over non-resident persons or corporations is not a crystal-clear question in some cases. PG hasn’t read the Complaint filed on behalf of Ms. Kardashian, but suspects Missguided and/or its US subsidiary may have advertised and/or sold its products in California.